How to get 1,000 email subscribers in 30 days. 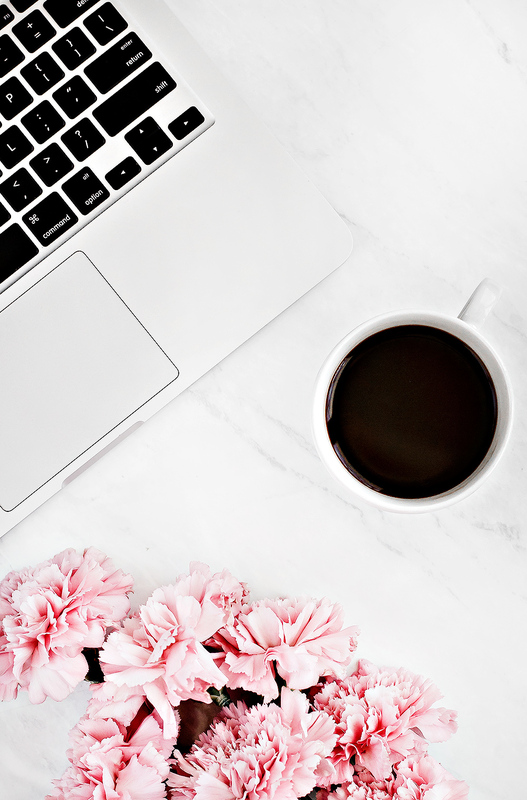 If you don’t yet know how crucial having an email list is to monetizing and growing your blog, you can catch up reading this post. One of the easiest ways to grow your email list is by creating content upgrades to your blog posts- we already covered creating incentives right here. Today we will talk about creating a free email course, which is another great way of growing your email list. I’ve had the most success with this method. 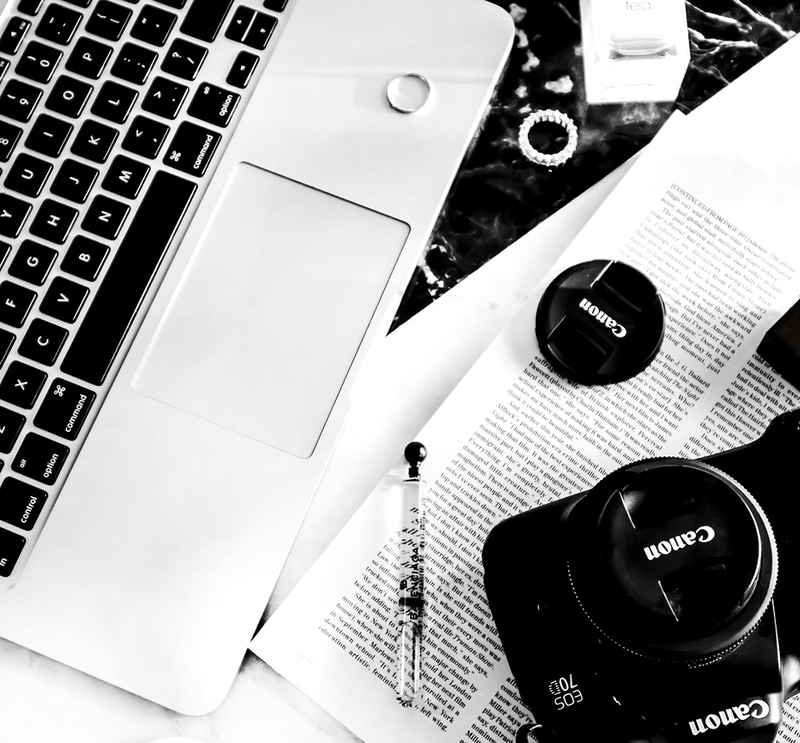 My free “start a blog* course not only helped me get 1,000 email subscribers in just the first 30 days, but it also connected me with some pretty amazing people, whom I got to introduce to the world of blogging. If I’m being honest, I REALLY wanted to create this course for a while, but kind of dreaded finally sitting down and setting everything up. Turns out, when I finally did sit down to do it, it only took me about 2 hours! See, one of the most amazing things about blogging is that you never stop learning. And, the easiest way to learn to do things is by… well, just doing them. So if you’re feeling a bit intimidated right now- trust me, you can do this. To create my free email course I used ConvertKit, which not only makes setting up your free email course easy (you set it up, automate it and let your email list grow on autopilot), but it’s also one of my favorite blogging tools that I can’t recommend highly enough. 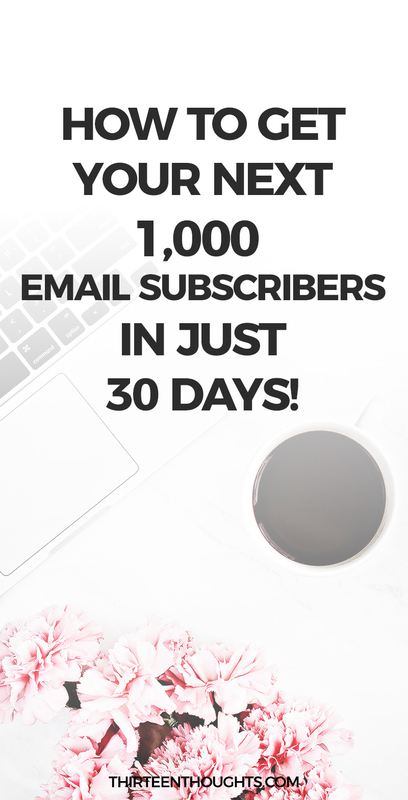 Okay, ready to get 1,000 email subscribers in the next 30 days? The first thing you need to do is to decide what your course will be all about. Yes, you do already have the knowledge it takes to create a free email course. No, you don’t need to be an expert. Yes, you are awesome and you can totally get this done- all you need to do is sit down for an hour or two with your laptop and a piece of paper. Think of some things you already know or are skilled at. How can you help your readers? What are some pain points you can help solve? What kind of content gets most engagement on your blog? Grab a piece of paper and write out your ideas, list all of your most popular content/blog posts- what do they have in common? Which posts get the most love from your audience? Once you have an idea for a course, you will then need to decide how long your course will be and create a simple outline for it. It can take place over 5 days, 7 days; you can send out your lessons every day, or only on certain days of the week, etc. ConvertKit gives you complete freedom when it comes to designing your email course. Next, you will have to write up your lessons. Don’t let this step intimidate you- it’s just like writing several blog posts, but with a more personal touch. Divide your topic into lessons- you can also think of them as chapters. Your first lesson should be an introduction, in your second lesson you can discuss the basics, and so on. You can also use content you already published as a template- just expand upon post/lesson in more detail and remember to provide your subscribers with value. Remember that content is king, perfection is not, so don’t overcomplicate things! Afterall, you’re giving away the course for free, so you don’t have wait until things are perfect before you finally launch your email course. 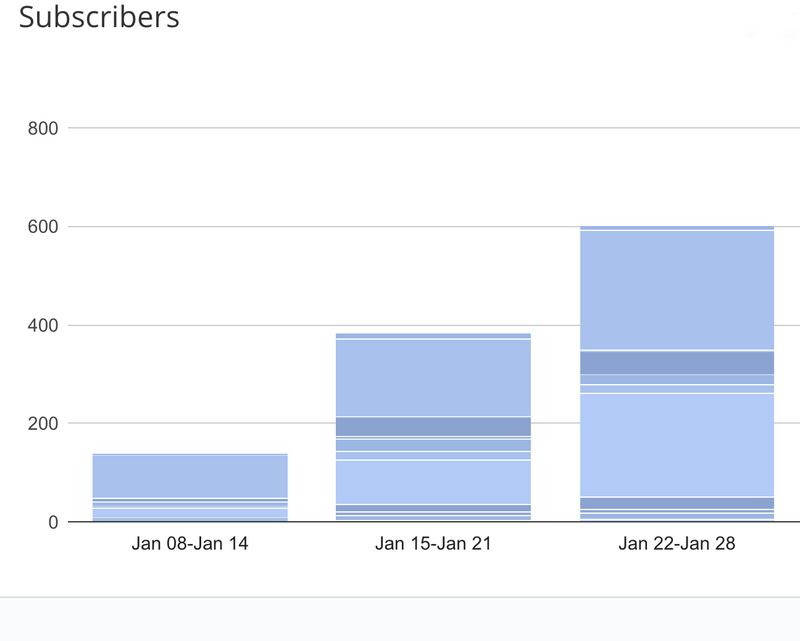 You can see that since launching my free email course in January, the number of my subscribers began to grow pretty quickly. Setting up your course in ConvertKit is very simple. Once you have your lessons all written up, you can simply copy and paste them into your sequence. There are several options to do this and again, this depends on how long your course will be. You can choose to have the emails go out every day, every two days, etc. A sequence is basically a series of emails that will be sent out automatically and will be delivered based on the subscription date of each subscriber. You can add as many emails to your sequence as you want, with one email a day, maximum. You can check out a video tutorial on creating sequences right here. I highly recommend that you have your first lesson go out immediately. Once someone gives you their email and signs up for your course, the excitement is new and fresh, and you want to take advantage of that and give them what they want, right away, to keep them excited. Once you’re done setting up your lessons, add a follow-up email. Ask your students how they liked the course, check-in with them and provide links to all the lessons, just in case they need to go back and review them. If you have a digital product you sell, you can remind them about that in that follow-up email, too. 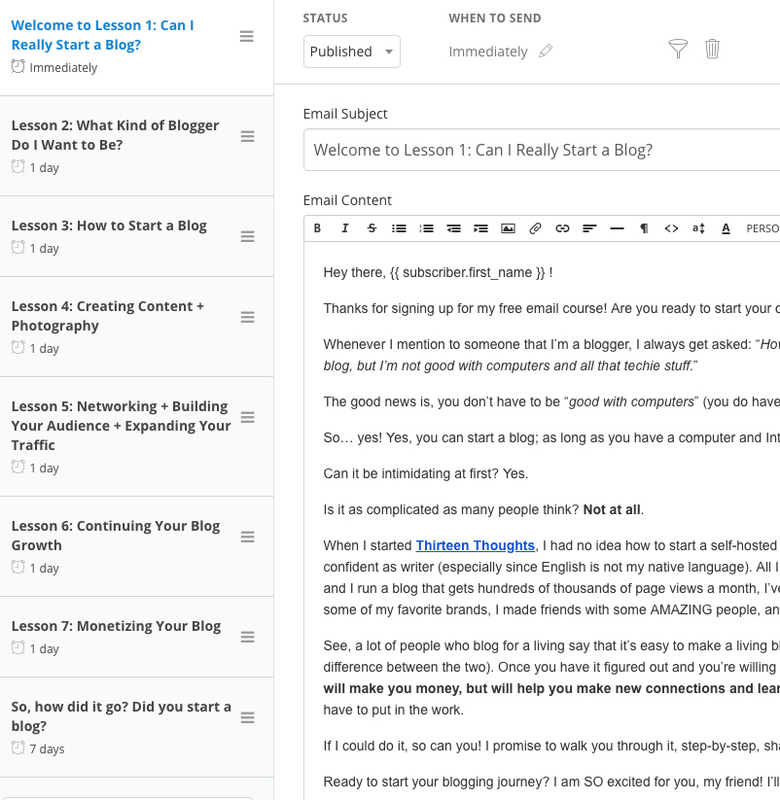 Of course, one of the simplest ways to spread the word about your free email course is by writing up a blog post- which is what I did. Once you are done setting up your sequence, you will then have to connect it to a sign-up form and embed it somewhere on your blog. With ConvertKit, you can embed a sign-up form for your course on your homepage and other popular posts. There also is, of course, my favorite free way to market and promote your content: Pinterest. You can create multiple pins, with different images- all linking to your blog post promoting your course and you will get 1,000 email subscribers in just 30 days. If you experience traffic spikes, you can take advantage of that too- embed your sign up form in some of those popular blog posts. Don’t be shy and spread the word about your free course. You can try ConvertKit completely free right here. If you want to find more ways to monetize your blog, having a strong email list is a must and ConvertKit makes it very easy to not only grow your list, but also group your subscribers, set up sequences, broadcasts, and automations.